Chocolate dispenser to make, keep and serve the hot chocolate. Has stirrer which constantly stirs the chocolate, thereby maintaining is texture. Bain-marie heating system, maintaing the purity of the chocolate without reheating it. Temperature regulation by way of a thermostat. Thermally insulated with minimum energy consumption. Interior tank, tap and removable stirring paddles to facilitate cleaning. 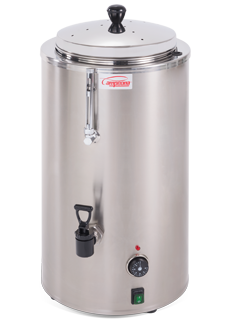 Maintains the operating temperture constant from the interior tank to the tap spout outlet.